In my time using Corporate Job Bank for our staffing needs, they have given us impeccable service and shown their ability to adapt to our needs as they change throughout the course of the year. With a very understanding and friendly staff, they have continued to be extremely competitive in their pricing, while also successfully screening potential employees to our specific needs. All in all, Corporate Job Bank does a fantastic job communicating and managing our account, which allows for a stress-free relationship for our company! I’m writing this review because I’ve spent a lot of time dealing with temporary work forces and their staffing services, and have been sadly disappointed by most. However, I have to tell you, Corporate Job Bank is a breath of fresh air. Teshia and her staff make the demands on me easy. No matter what the issue is good or bad they handle it promptly and swiftly, with absolute grace and the utmost integrity. Here on our job site, we’ve had a few issues and I know I only have to make one call. I never have issues with getting workers, even when it’s last minute, which I’m ridiculously guilty of. The workers they send stay with us, they show up every day. Which is impressive because we have a demanding 60-hour work schedule, which also tells me that they take the time to find the right candidate for our job site. So thank you Corporate Job Bank, and thank you Teshia, Chrissi, and Letty. Thank you for returning my faith in staffing service. In my opinion, you are the top of the class. Every staffing service should follow CJB’s example. [Our Loan Center] is a Palm Springs based company, so looking for mortgage talent with experience has been difficult at times. We have used Corporate Job Bank to help us successfully place a few different positions here. Not only have we gotten the right candidate for the job, but support all the way from the interview process to 30 day follow ups after the position has been filled. We look forward to working with them in the future to continue to assist us in filling various employment needs. I have known and done business with Paul Boca and Corporate Job Bank for over 20 years. During this period, Corporate Job Bank has placed a number of administrative and key executive personnel that have enhanced the overall quality of our organization. One of the greatest additions Paul made to his Corporate Job Bank Team was the hire of Joe DiGiovanni. Joe has proven to be an expert in finding and identifying qualified candidates for hire. This is a talent not too many people have and has proven to be a major benefit to my staff while managing the hiring process. Corporate Job Bank has always stood behind their hires and if for any reason a new hire did not work out, Corporate Job Bank replaced them in an expeditious manner. I highly recommend Corporate Job Bank for any of your staffing needs. 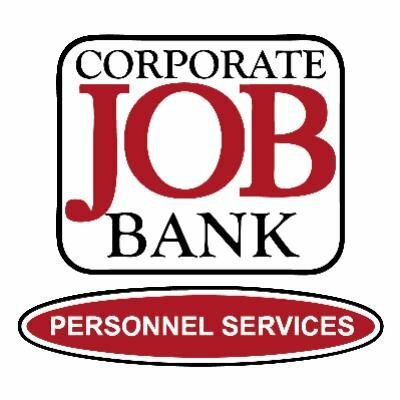 I’ve had the pleasure of working with the folks at Corporate Job Bank for many years. They have always come through for us. I count them as a necessary tool for sourcing quality candidates. We more than make up for the fees they charge by the combination of freeing us up to keep originating while serving up the best candidates out there. I highly recommend them. We at Lincoln Strategy Group, have been nothing but thrilled at the quality of the temp-to-hire workers we have had from Corporate Job Bank! They have always been so quick to fill our needs, quick to respond to emails, quick to be of service to us in any capacity. I especially appreciate the fact that they came to visit our office so they could get a feel for our corporate culture so that they could better serve us! Thanks, CJB for doing such a great job! t is with much enthusiasm that I am writing to recommend the services of Corporate Job Bank, but more importantly the partnership with Andrew Boca. I have been using Corporate Job Bank as our preferred staffing agency, and I have been more than satisfied with the results. They have continued to bring me well qualified candidates, ranging from 3-20 employees a week. Any time that there have been modifications in hiring, they have been quick to accommodate our requirements. I have also used their services for Executive Recruiting to hire a Business Developer, and Andrew delivered more candidates than expected and managed the hiring process for 4 months. He truly went above and beyond to help us fill a very crucial role in our company. I am happy to recommend a partnership with Andrew Boca. With his creative thinking and hard work ethic, he truly has raised the bar for staffing. I just want to thank you for who you are and what you do. I’ve been with CJB since 2000 when you guys helped me get in with [one of your financial clients]. I’m so glad I finally met you because now I know the real reason I have stayed with you guys for so long. You genuinely care about your clients, on both sides, as well as your employees. I just had to say that and say thank you again! Very much appreciated! My experience with CJB has been GREAT!! I was working full time at a company with full benefits as a customer service rep and decided to leave that job after 1.5 years of service, to take a chance working with a temp agency in hopes of finding a professional career. This was very risky. I must say this was the BEST RISKY decision that I could have made! I first met with my account manager and she suggested I speak to her boss (VP) because he had an assignment that she felt I would be a perfect fit. I spoke to her boss and he agreed. I went on my first interview for a receptionist position at [one of your client’s sites]. I had two interviews with this company and on the second interview they offered me the position and I started the next day!! I have finished my 90 days with CJB and I am now officially a fulltime employee with [CJB’s client]. I have enjoyed all 90 days working with CJB and the ENTIRE staff has been professional and VERY helpful with any questions or concerns that I have had. I have recommended past co-workers and now I am recommending to whomever reads this review and is truly looking for work, to apply with CJB. I am so glad that a past co-worker recommended CJB to me and that I took her advice!! KEEP UP THE GREAT WORK!!! Corporate Job Bank was fantastic at finding me a career, not just another job, a career. They were always available when I needed help with my time card, time off, or any general questions. They work with great companies. I interviewed with them and within a month, I was placed as a temp and eventually hired as a full-time employee. The staff work together to find a perfect fit for a position. Very professional, friendly staff. Response time was very fast. Had a job the day I interviewed. No red tape, or the usual delays. Would highly recommend to anyone in need of employment. Corporate Job Bank goes above and beyond to help their employees reach their potential. I started about two years ago and have grown with the company. My co-workers are some of the best people I have ever met. Executives take time to speak with you about your goals and how they might align with the company. There are always open job postings in nearly every industry and every person in the company does the best they can to assist those looking for a job. They always attempt to customize their approach with each client to meet their specific needs. CJB is the best you can get when it comes to the staffing industry.